In the last two posts, we reviewed documenting your processes and identifying areas for improvement. Now it’s time to introduce positive change. 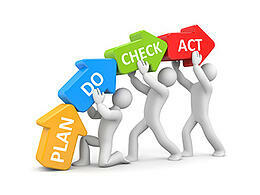 When implementing any process improvement, you must plan. The most important part of that plan is testing. Whenever possible, conduct testing in a non-production environment. For systems, this means using a domain or server specifically designed for testing purposes. For new equipment, you'll want to conduct testing at the factory and after installation at your site. When testing, use a written checklist of all steps impacted. Follow the order used in actual production and don't skip any steps. If minor problems arise, make a notation for follow-up and continue on. Stop the tests if any major issue surfaces and don't proceed until the problem is resolved. Extra time in testing will prevent issues in production. After the changes have been thoroughly tested, you're ready for implementation. Whenever possible, schedule implementation during a slow, non-critical time for your operation. Closely monitor the work as it moves through the new process. Have a plan in place to back out any new software or programs if a critical error occurs. When replacing printers or finishing equipment, keep the old equipment nearby. Introducing changes requires leadership boldness. Implementing those changes requires caution and patience. After successfully implementing changes to a process, review your work. This review should cover two points: did the process improvements meet the objectives? And, was the method used to implement the changes effective? When evaluating the impact of the improvements, you should compare the new process to both the stated goals and the baseline metrics. Explain why there's any deviation from the objective – both positive and negative. Include any added benefits not known before implementation. For example, new equipment decreased processing times, and it also helped improve morale and reduced absenteeism. Review the methodology for implementing the process improvements. Report on what was done well, and on any extra efforts made by team members. Determine what could have been done better during the project. Don't hide anything; examine every step. At the beginning of this exercise, you mapped out the existing lifecycle of the document. Update that map to include the improvements implemented. Document any new processes with step-by-step instructions. Include the names of team members as a reference for future improvements. And future improvements will be needed. One truth about improving processes is that your work is never done. New technologies, changes in business plans, a better understanding of your customers - these all will lead to the need to adjust your processes to remain efficient and effective. Be proud of your team achievements, but never remain satisfied. Continue your journey in process improvements.